Pictured from left to right: (Back row) Ian Hlavacek, Clint McManus, Toloria Allen, Dian Nostikasari, Capt. Kristine Anthony, Oni Blair, Katrina Bayer, Neil Bremner, Robin Holzer, Mike VanDusen, Adam Williams, Veon McReynolds, Doug Overman, Amar Mohite, and Alejandro Perez. (Front row) Beth Martin, Sandra Rodriguez, Jennifer Ostlind, Maya Ford, Clark Martinson, and Yuhayna Mahmud. The committee will advise and make recommendations to the Planning Commission and Planning Director on bicycling issues in Houston, including amendments to the Bike Plan, bicycle safety and education, strategies for funding projects, and promoting public participation in bicycling. The Committee was established by ordinance in 2017 to assist in implementation of the Houston Bike Plan. 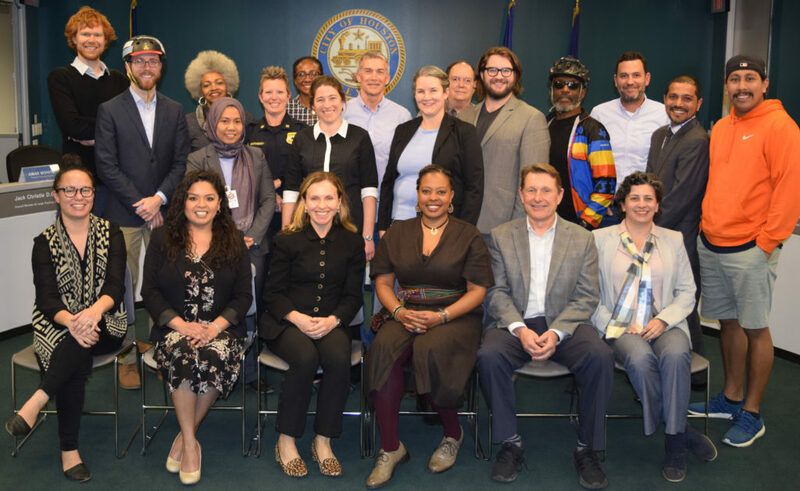 The Chair and Vice Chair of the Bicycle Advisory Committee (BAC) formed two subcommittees in May 2018. The two subcommittees are the Infrastructure Subcommittee and the Education Subcommittee. These two subcommittees were established in order to draft recommendations for consideration by the BAC. The Infrastructure Subcommittee will address topics related to selecting, designing and implementing the Bike Plan’s proposed network of bikeways. The Education Subcommittee will address educational programs and tools needed to increase safety for vulnerable road users. The equitable distribution of new bike infrastructure and safety of vulnerable road users will be core components of both subcommittees. The subcommittees will meet in alternating months that the full BAC is not meeting (i.e. Infrastructure Subcommittee will meet in May, the Education Subcommittee will meet in June, and the full BAC meeting will be held in July). Sandra Rodriguez, Houston Health Department/Gulfton Neighborhood Rep.
Dr. Veon McReynolds, Third Ward/South Houston Neighborhood Rep.
“I” indicates a member who is serving on the Infrastructure Subcommittee. “E” indicates service on the Education Subcommittee.